To request a consultation and learn more about how we can help improve your quality of life, please request an appointment now. During his orthopedic surgery residency at the University of Virginia, in Charlottesville, Dr. Goff was selected to be the Harvard Intercontinental Shoulder Fellow. The fellowship consisted of six months under the mentorship of Dr. Jon JP Warner, Dr. Tom Holovacs, and Dr. Laurence D. Higgins at Massachusetts General Hospital and the Brigham and Women’s Hospital in Boston. The second six months of the fellowship was spent in Switzerland at the University of Zurich, Balgrist, under the mentorship of Professor Christian Gerber. The Intercontinental Shoulder Fellowship provided Dr. Goff with the opportunity to travel extensively throughout Europe and work with several master shoulder surgeons, including Dr. Gilles Walch in Lyon, France, and Dr. Laurent Lafosse in Annecy, France. Dr. Goff has advanced knowledge and training in all aspects of shoulder surgery. His interests include the entire spectrum of pathologies of the shoulder. He specializes in major reconstruction procedures of the shoulder, including total shoulder replacement, arthroscopic rotator cuff repair, instability procedures, fracture repair, revision surgery, and the care of throwing athletes. Dr. Goff lives in Marin County with his family and enjoys both mountain and road biking. He has been a team physician for the United States Ski Team, working with both the Men’s Alpine Team and the Combined Freestyle Team. 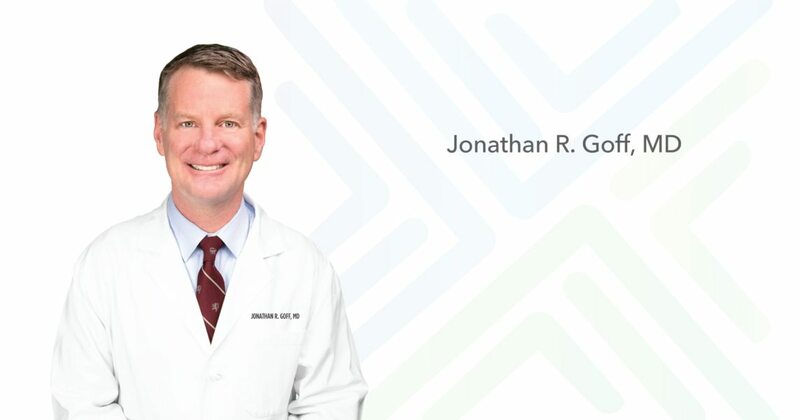 To learn more about Dr. Goff, please visit www.marinshoulder.com. 08/1997–05/2001 MD Georgetown University School of Medicine, Washington, D.C.
07/1995–05/1997 Research Assistant, Department of Neurosurgery, Georgetown University, Washington, D.C.
06/1992–10/1992 Intern, Deloitte Touche Tohmatsu International: International Lending Agency Group, Washington D.C.
Goff JR, Burkey AR, Goff DJ, Jasmin L. Reorganization of the Spinal Dorsal Horn in Models of Chronic Pain: Correlation with Behavior. Neuroscience 1998. Goff JR, Jasmin L. Plasticity in the Dorsal Horn Following Neuropathic Injury and Inflammation. Society for Neuroscience Abstract. 26th Annual Meeting 1996. Jasmin L, Kohan L, Franssen M, Janni G, Goff JR. The cold plate as a test of chronic neuropathic and inflammatory pain models. Pain 1998.